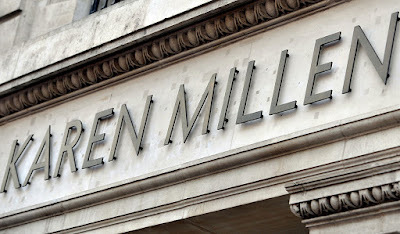 Today’s post aims to use the story that broke recently, that designer Karen Millen has been declared bankrupt after failing to pay a £6 million tax bill, to show that the recent calls by the Financial Exclusion Committee – to promote financial education earlier, and much more strenuously, as discussed in Financial Regulation Matters recently - is of paramount importance. Karen Millen, who as we shall discuss came from the bottom of society to become a household name and would go on to be recognised for her services to fashion, is now, arguably, bankrupt because of the iniquities that exist within the financial arena – in this post, the aim will be to discuss this, and show how an extensive coverage of this concerted effort to educate children on financial matters would, potentially, see an end to instances where those who have talent are being destroyed by those who understand the parameters of a system that naïve participants do not even recognise they are subjected to. Karen Millen is a woman synonymous with fashion because, as many news outlets have been keen to discuss, she started with a £100 loan at 19 and grew her business to a 130-store chain that spanned across the globe, before selling the business for £95 million in 2004 (for which she received a £35 million share). This remarkable story of entrepreneurship is indeed remarkable, but is a story that cannot be recalled on its own right anymore, particularly after this week’s events. Millen, who was awarded an OBE in 2008 for her services to fashion, was said to be ‘deeply devastated’ at being unable to pay the £6 million tax bill, which leads to the natural question – why was she unable to pay the bill? One news outlet in the U.K. attributes this loss to greed, adding that she had been ‘foolish’ to get involved with a tax-avoidance scheme which was subsequently blocked by the Court of Appeal. With her payoff from the sale of the Karen Millen brand and business to Icelandic bank Kaupthing, a bank which would go on to be synonymous with the starting of the domino-effect that was the Financial Crisis, Millen placed a large number of her funds in schemes designed to increase her wealth, but also protect it via tax-avoidance schemes like the ‘round the world’ tax scheme whereby members were offered the chance to avoid paying capital gains tax on the sale of shares by transferring them to trustees in countries that had zero tax rates – like Mauritius. On the face of it, Millen’s case looks like a case of a rich person looking to increase their wealth, and then coming unstuck. Whilst news outlets such as the Daily Mail may revel in this, there are more important issues that operate under the surface. Recently, in Financial Regulation Matters, we seen how there is a recognition of the need to promote financial education at a much earlier age in the U.K., and to a much more stringent standard. That sentiment was championed by this author, because there are a number of vulnerable groups which may be able to protect themselves better from the actions of the venal in society, if they were better informed. Even though we are mentioning large figures, it is important that we take a step back and take a wider look at this term ‘vulnerable’. Karen Millen was a millionaire, was rightly recognised for her services to fashion, and is still a household name across the world. However, in reality, Millen was raised on a council estate and received a state education. Also, her talents are artistic in nature, and she confirms that when she discussed how she was ‘never the driving force’ behind the growth and development of the business. Whilst some, like the Daily Mail, may find it distasteful to associate someone who lives in a palatial mansion in Kent with the term ‘vulnerable’, it cannot be denied that Millen has never received financial education as part of her development, was thrusted into the financial arena by way of the success of her company which was driven by her ex-husband, and whose natural affiliation to the arts make her extremely susceptible to the iniquities of the financial arena – and that is precisely what happened, with the Daily Mail itself confirming (in the same article it accuses her of greed and foolishness) that the tax avoidance scheme was recommended to Millen by ‘several accountancy firms’. The source continues by stating that Millen ‘should have known the scheme was “risky”’ and that ‘unfortunately, there was one test case involving a member whose accountant had left a paper trail to this country and on the back of that everyone else – included Ms Millen – will now have to pay the tax owed in the U.K.’. Millen’s lack of understanding of the business arena is also, arguably, confirmed when we understand that she commenced litigation against the administrators of the failed Icelandic bank for the purposes of being allowed the right to use her name for a separate business, having already sold that right to the Icelandic bank – the judge ruled, rather predictably, that this was not possible and, as such, Ms Millen was to pay the defendant’s legal fees which, all in all, totalled over £3 million. Although it is yet to be fully revealed by Millen, it is also believed that she had invested in Icelandic products before the crash, on the basis of her liaisons with the Icelandic bank. All of these instances point to a person being ill-educated in a world that prays upon such people. Is it likely that there will be people who dismiss this sentiment and attribute greed as the reason for Millen’s downfall? Absolutely. However, it is vital that for all of those who sing the praises of people who succeed against all the odds, they must also recognise that they are people who have no idea about the concepts of high finance and the workings of the financial arena. This is not to disparage those who come from this start in life – like Millen, the daughter of a carpet-fitter and a secretary – but rather to emphasise the point that people who enter the financial world with large amounts of money but little to no financial education, and survive, are incredibly lucky. The financial arena, although containing a lot of honourable and ethical organisations, also contains a large number of venal and unscrupulous people who prey upon people who this post is labelling as ‘financially vulnerable’. The calls of the Financial Exclusion Committee are not only necessary, but need to be expanded and developed further. Rather than describing why it is important to know the dangers and parameters of personal credit, for example, it is important we develop the understanding of the need to prioritise financial education in all of our personal endeavours, and even more so if one has large amounts of money – it is not enough to trust in financial practitioners, because recent events tell us, quite clearly, that to trust in them implicitly is ‘foolish’. Financial education, and its incorporation into our everyday thinking is not difficult, if we remove the façade of complexity that is constantly championed by those with a vested interest, as has been discussed before in Financial Regulation Matters. It is vital that we instil this in people, because it can help save people from losing everything unnecessarily – unfortunately, that message comes too late for Karen Millen.